Brian Sieman, the radio voice of the L.A. Clippers, describes it best. 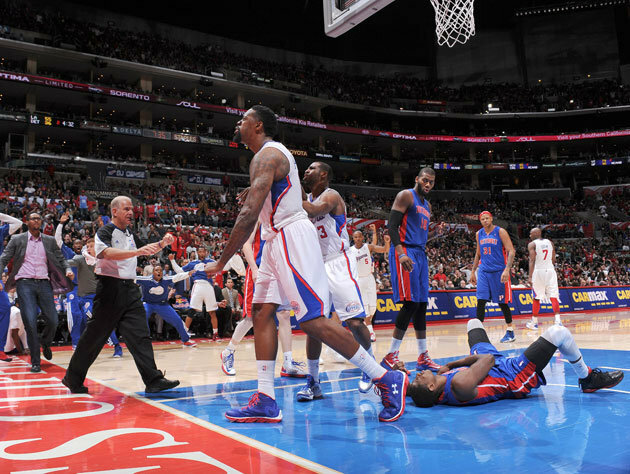 DeAndre Jordan’s facial posterization of the Pistons’ Brandon Knight looks like the frontrunner for Dunk of the Year. Look at the Blake Griffin and the Clipper bench… they’re already starting to stand up while the ball is in the air. They knew what was coming. No matter what happens to the Clippers in the future (which probably won’t be good), we’ll always have the memories of the Lob City years. Cousin D (of Cowboys’ Corner fame) made a bold prediction that the Heat would not make the NBA Finals, stating as his main reason,” Them boys in Indiana look hungry!” After the Heat’s destruction of the Pacers last night, they’ve probably lost their appetite.